BookMyShow is the most used online movie and events ticketing website. To promote their app, they are giving free Rs. 100 instant credit on new user signup. This free credit is put into your account on activating BookMyShow wallet using referral code. The referral credit of Rs.100 has an expiry of 60 days from the date of credit. You can book a ticket with this Rs.100. If the ticket amount is more than Rs.100, pay the rest amount using other methods online. 1) Download BookMyShow app on your mobile. 2) Now signup using your mobile number and email. 3) Then click on ‘You’ tab and go to ‘MyWallet’ option. 4) Now apply referral code P9KWMKP to get free Rs.100 credit in BookMyShow wallet. After booking your first free ticket, you will get your own referral code in ‘ReferMyFriend’ tab. Then use this referral code to activate wallet on your family and friend’s phones. 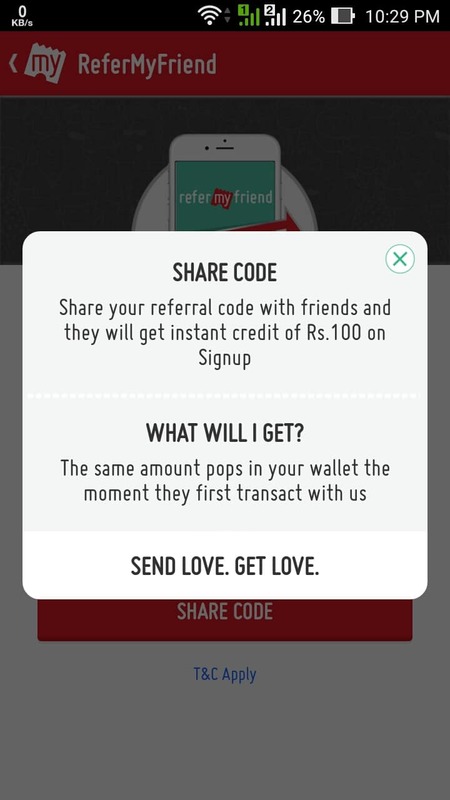 For each referral who activates wallet using your code, you will get free Rs.100 in your wallet. You can refer a maximum of 15 referrals per account. Hurry up, this program is only available till 1st January, 2016. Note: It’s necessary to order a ticket first to get your own referral code. I M Tarun Singh Copyright © 2019.